The US may not be negotiating with North Korea in good faith amidst news Washington has called off an upcoming round of discussions, an analyst told Sputnik Monday. When US President Donald Trump cancelled his chief diplomat's upcoming visit to North Korea last Friday, he claimed the socialist country hadn't done enough toward the mutual goal of denuclearizing the Korean Peninsula for the next round of talks to proceed. However, a leading policy expert told Sputnik Monday that "in almost all of the give-and-take, the ‘give' has come from North Korea." In a trio of tweets on August 24, Trump announced that Secretary of State Mike Pompeo's upcoming fourth visit to the Democratic People's Republic of Korea (DPRK) would be placed on hold, claiming North Korea hadn't fulfilled enough conditions from the two nations' historic June 12 summit in Singapore to continue the process. 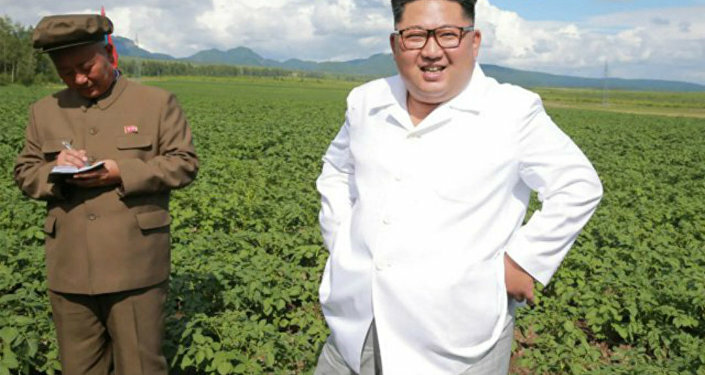 The news followed a report days earlier by the UN's International Atomic Energy Agency (IAEA) saying that North Korea had not totally stopped its nuclear activities, alleging it had seen evidence commensurate with the continuation of uranium enrichment as well as continued construction at the country's primary nuclear site. Further, Trump seemed to lay the responsibility for the stall in denuclearization at China's feet. Trump has seen Chinese President Xi Jinping as key to putting pressure on North Korea leader Kim Jong Un to cooperate with US policy goals, Sputnik noted Friday. Due to go with Pompeo was the newly appointed special representative for North Korea is Stephen Biegun, whose purpose is to "direct US policy towards North Korea and lead our efforts to achieve President Trump's goal of the final, fully verified denuclearization of North Korea as agreed to by Kim Jong Un," Pompeo announced Thursday, Sputnik reported. On Sunday, the North Korean government fired back. Rodong Sinmun, an state news organ, accusing the US of "double-dealing" and "hatching a criminal plot" against the country, Sputnik reported. "Such acts prove that the US is hatching a criminal plot to unleash a war against the DPRK and commit a crime which deserves merciless divine punishment in case the US fails in the scenario of the DPRK's unjust and brigandish denuclearisation first," the newspaper said. Noting that the US and Japan were presently engaged in an air drill that rehearsed "the infiltration of Pyongyang," the paper wrote, "we cannot but take a serious note of the double-dealing attitudes of the US as it is busy staging secret drills involving man-killing special units while having a dialogue with a smile on its face." On the South Korean side, the Yonhap News Agency reported Sunday, citing an official from the office of South Korean President Moon Jae In, that Moon may have to be the one to break the stalemate between Washington and Pyongyang by adopting the role of mediator at his next summit with Kim in mid-September, Sputnik reported. "President Moon's role has only become greater," the official said. "Objectively, [Moon's] role as a facilitator and mediator to help expand the range of mutual understanding between the US and North Korea has become greater." 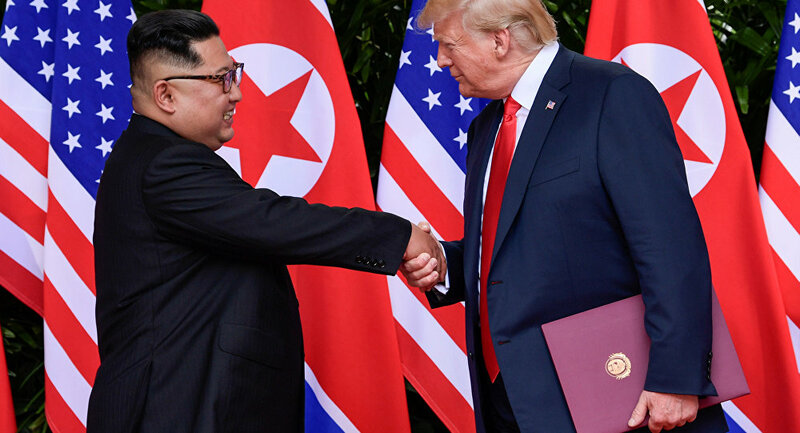 Dr. Christine Hong, associate professor of critical race and ethnic studies at UC Santa Cruz and a member of the Korea Policy Institute, spoke with Sputnik Radio's Loud & Clear about the developments. ​"We weren't exactly proceeding from secure footing prior to this, so these kinds of highs and lows will be part of the process, but I really hope that this isn't going to be the start of a series of these kinds of sort of stalled moments," the professor told hosts John Kiriakou and Brian Becker. "You know, I mean it's really unfortunate for this to happen at this point. It's interesting that it's not just that North Korea is stating that the United States was conducting secret war exercises; it's also the case that just the kind of narrative that's prevailing right now in the media is that North Korea is not a reliable partner to negotiate with, and that Donald Trump was really foolish to even entertain the possibility of negotiations of any kind." "What this centrally does not acknowledge is the fact that in almost all of the give-and-take, the ‘give' has come from North Korea…. [A]nd this is keeping in mind that North Korea has stated from the very outset that it's willing to do measure-for-measure. It's willing to do a step-by-step process in terms of negotiations. Which means that for everything that it does, it expects a good faith gesture, some sort of commensurate action on the part of the United States," she said. Hong noted that so far, North Korea "has not only capped its nuclear testing for something like 200 days, it's basically suspended that, and that's huge. It's dismantled nuclear testing sites. The other thing that it's done is it released three Korean-Americans who were in prison in North Korea for committing acts against the state. And then recently, it released the remains, for repatriation, of 55 American servicemen who were killed during the ‘hot fighting' period of the Korean War. What the United States has done is suspend one war exercise. And so if you're looking at the balance sheet, it's actually not the case that North Korea's not keeping up its end of the bargain; it's really the United States." Hong noted that US national security adviser John Bolton has met with conservative elements in South Korea who are vehemently against "any sort of engagement with North Korea. And this is a profoundly minority view. Even if Moon Jae In's overall popularity ratings have somewhat tanked in recent weeks, the fact of the matter is that his pro-engagement with North Korea policy was, and still is, a kind of majority policy. He was deputized by the South Korean people to do that. So what you see right now is the United States basically acting against the democratic interests of the Korean people, both North and South." "And you see the United States willing to try to exert whatever kind of influence it has to basically upend any sort of possibility of peace. It's not the first time that we've seen this. During the George W Bush era, this was also a time of historic rapprochement between the two Koreas. And who did George W Bush align himself with in South Korea? He aligned himself with die-hard hawkish North Korean human rights activists — these figures, some of whom were defectors, and really had a kind of war agenda with regard to North Korea. And against the desires of the overwhelming majority of the Korean people, North and South, for peace and reconciliation, he went against the Sunshine Policy of the then-liberal presidents who were in South Korea and embraced a sort of defector-based, human rights, war interventionist policy that you could call an ‘eclipse policy.'" The Sunshine Policy was a South Korean doctrine for relations with North Korea, begun by South Korean President Kim Dae Jung in 1998, in which the South sought reconciliation with the North through cooperation and renounced attempts to incorporate the socialist North into the capitalist South (as had recently happened to several states divided into capitalist and socialist halves, such as Yemen and Germany, in the 1990s). But in turn, the South would not tolerate military provocations from the North. The policy was slowly abandoned after 2006 amid a renewal in North Korean weapons tests, including its first nuclear bomb detonation. On Saturday, China responded to Trump's accusations, calling his comments "irresponsible." "The claims made by the US contradict the facts; they are irresponsible. We express deep concern in this regard and have already made a submission to the US side," Chinese Foreign Affairs Ministry spokesperson Lu Kang said. Earlier this month, Trump criticized Beijing in a similar fashion, reportedly saying that "China may be getting in our way" with regards to North Korea, without expanding on that statement, Sputnik reported. Chinese Foreign Ministry spokesman Geng Shuang said August 1, "China's position on the settlement of the situation on the Korean Peninsula is well known to everyone, from the very beginning we have made significant efforts to advance the settlement of the Korean Peninsula problem, and our efforts are recognized by the international community." Hong continued, "Trump's take on China has been perplexing to me from day one. From the beginning, he suggested that, it was still a kind of version of that old, very strange approach of trying to outsource US-North Korea policy to China when the geostrategic interests of both nations are not one and the same. But I think right now what we're looking at are a couple of things. One, when Trump was speaking the process of peace with North Korea, you could see a kind of rigid spine response on the part of all of those who stand up and salute the military-industrial complex. So, you basically had the bipartisan war party emerge in force against the prospect of Trump even beginning to draw down US forces abroad; he has this very sort of weird notion that US military occupation abroad is a form of charity to those nations that are so occupied, but be that as it may, his desire to draw things down has been resisted on the level of Congress. So he's not getting any political capital from pushing a kind of engagement policy with North Korea in this particular juncture." "With regard to China and Russia, I think it's interesting that they've just been talking sense. China's really moved away from a kind of policy of walking more or less in lock-step with US sanctions policy, and they've stated, rightly so, that at this particular moment, when North Korea has made a number of good-faith concessions for the prospect of engagement with the United States, that the United States actually needs to scale back some of its sanctions. Russia has said the same. So basically you're seeing a kind of division on the level of policy in which the US perspective and China's perspective with regard to North Korea, in this moment when North Korea is making great strides to outreach to the United States, you see a cleavage in policy."